Identification of new archaea species elucidates the domain’s unique biology and sheds light on its relationship to eukaryotes. Every summer from 2013 to 2015, Dimitry Sorokin waded into the shallow, briny, alkaline lakes of Siberia’s Kulunda Steppe. Pale carbonate minerals crusted the pools’ edges, where lambs, too young to know the perils of drinking here, sometimes perished on the shores. As the water lapped at his thighs and abdomen, the stink of sulfur, which bubbled up along with methane from the disturbed sediments, filled his nostrils. “For me, it’s Chanel No. 5,” says the microbiologist, who splits his time between the Russian Academy of Sciences in Moscow and Delft University of Technology in the Netherlands. ON THE HUNT: Dimitry Sorokin takes samples of anaerobic sediments from a hypersaline soda lake in southern Russia in July 2013. Analyzing the samples back in his lab in Moscow, he identified a new class of methane-producing archaea, which he dubbed Methanonatronarchaeia. But while these microbes are relatively new to biology, their lineage is ancient. In fact, the group was named by Carl Woese in 1977 based on the Greek for “old ones.” Previously, the organisms he christened Archaebacteria were considered simply prokaryotes, along with other bacteria. Today, many scientists agree that, among the profusion and variety of archaea, they have likely found the modern counterparts of eukaryotes’ ancestors. Although they escaped notice for much of the history of biology, archaea are everywhere. Contrary to the beliefs of scientists working with archaea when they were first discovered, members of the domain aren’t limited to extreme environments; they just tend to be overshadowed by other, more abundant microorganisms in less dramatic habitats. It’s only in harsh conditions that bacteria become less common, leaving archaea to rule. With better techniques to survey all the microorganisms in a given environment, researchers censusing Earth’s microbial diversity, from deep-sea vents to the Australian Outback, continue to turn up new groups of Archaea. And with these discoveries come insights into their unique and diverse biology, as well as their roles in the environment. After he brought home his mud samples, it took Sorokin a couple of years to figure out how to grow the microbes they contained and purify single-organism cultures. He read up on the metabolism of known methanogens, such as those found in the guts of termites and other animals, to find some clues to what the microbes might need. He eventually settled on a salt-saturated brew containing iron sulfide, methanol, and formate, at a pH near 10. 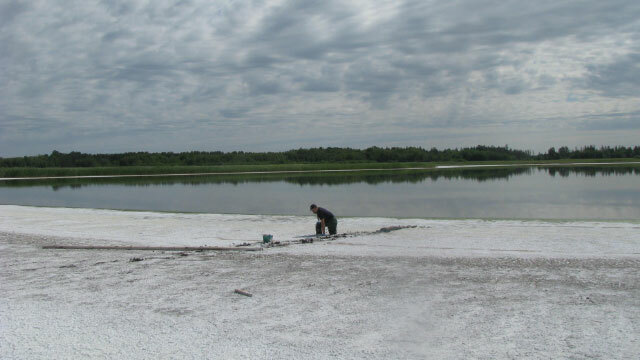 In most cases, he says, a key ingredient was sterilized sediments from the lakes themselves. A hearty dose of luck also helped him find the right recipe, he says. AN EVOLVING FAMILY TREE Thanks to a wealth of new genomic sequence data, the family tree of Archaea, which encompassed just two phyla 16 years ago, has exploded in recent years. It now includes more than a dozen phyla, organized into four informal “supergroups,” based mostly on sequence similarities. Scientists have yet to determine precisely how novel archaea should be classified. 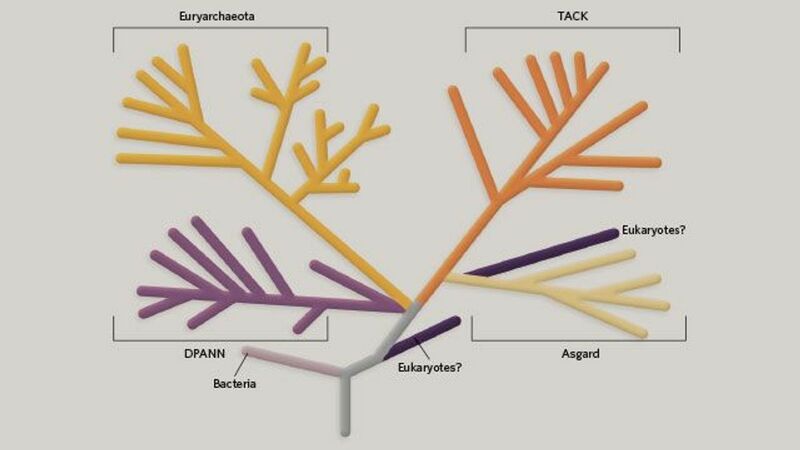 Also in dispute is how Eukarya fit into the picture—some scientists suggest they’re an offshoot of a branch known as Asgard archaea, while others suspect they diverged from Archaea earlier on. 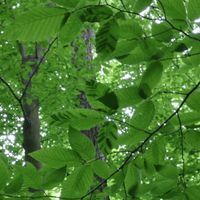 Researchers predict the tree will sprout many more branches in the years to come. TACK Scientists proposed the TACK name in 2011 to encompass the phyla Thaumarchaeota, Aigarchaeota, Crenarchaeota, and Korarchaeota;2 more phyla have been added since. Includes thermophiles. Thaumarchaeota participate in nitrogen cycling. Some are also methanogens. DPANN The first phylum named was Nanoarchaeota, in 2002, for a tiny deep-sea vent organism that didn’t fit into Euryarchaeota or Crenarchaeota.3 In 2013, researchers proposed linking it with the taxa Diapherotrites, Parvarchaeota, Aenigmarchaeota, and Nanohaloarchaeota.4 New phyla have been added since. At least some are small in size, with small genomes lacking genes for key proteins in metabolism and other processes. Some may rely on a symbiont or host organism to survive. In taking this classic culturing approach, however, Sorokin says he’s a “dinosaur.” Today, most microbiologists seeking novel archaea have embraced speedy, inexpensive sequencing—both to evaluate samples en masse, in the case of metagenomics, and to analyze individual cells. Such next-generation sequencing has allowed researchers to sidestep the problem that the vast majority of microorganisms can’t be cultured using current techniques. 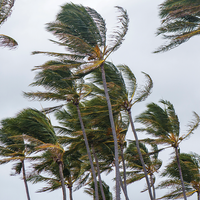 “We will flesh out the tree of life far more quickly than if we had been waiting for isolates,” says Gene Tyson, deputy director of the Australian Centre for Ecogenomics at the University of Queensland in Brisbane. But using sequence data to categorize newly identified species, or other taxonomic groups, is a formidable task. If microbes don’t grow in culture, scientists cannot characterize the morphology and behavior of a new group. Metagenomic results also sometimes lack the 16S rRNA genes (18S in eukaryotes) that researchers traditionally use to indicate evolutionary relationships between organisms, says Eme. This results from the way computer algorithms group sequences predicted to come from the same organism. The software might cluster sequences with similar nucleotide composition—for example, how often a tetranucleotide such as ATCC appears—and 16S genes often differ in nucleotide composition from the rest of their genome. Until the microbiology community develops a standardized naming system, it falls to discoverers—along with their computational tools—and publication reviewers to hash out the quickly evolving archaeal taxonomy. For example, in 2013, 22 researchers proposed the DPANN superphylum, based on single-cell sequencing data.4 But there’s tremendous species diversity within DPANN archaea, suggesting they might not be a single group at all. It’s possible, says Thijs Ettema of Uppsala University in Sweden, that computer phylogeny algorithms lump them together simply because they’re so peculiar compared to everything else. He and his colleagues tested the samples for evidence of true eukaryotes, such as their 18S rRNA, and came up empty-handed. Convinced that the microbes they identified were indeed archaea, the researchers reported their results in 2015, dubbing the new phylum Lokiarchaeota for the vent site.7 Since then, Ettema’s and Baker’s teams have found three sister phyla to Lokiarchaeota, all containing genes formerly thought to be specific to eukaryotes: the Thorarchaeota, found in the dark, tannic acid–stained White Oak River estuary of North Carolina;8 the Odinarchaeota, found in hot springs such as those in Yellowstone National Park;9 and the Heimdallarchaeota, discovered in marine sediments.9 The researchers grouped these together as the Asgard superphylum. Based on their interrogations of the asgardians, Ettema, Baker, and colleagues concluded that these archaea fit neatly into the late Lynn Margulis’s longstanding hypothesis of endosymbiosis—the idea that eukaryotes arose when one microbe engulfed another. The Asgard archaea would seem to be descendants of the original host that swallowed a bacterium, and at that time already possessed some of the genes scientists would come to associate with eukaryotes. This contrasts with the older idea that archaea and eukaryotes sprang from a common ancestor and evolved as two distinct, parallel lineages. The Lokiarchaeota provided the turning point, says Ettema: “Suddenly we come up with this phylum that seems to turn everything around.” He notes that Lokiarchaeota’s name references not only the discovery site but also the Norse trickster god for that reason. ARCHAEAL PARTNERS: Some Nanoarchaeota are ectosymbionts, living attached to other archaea. While the nature of this relationship remains unclear, some studies have found a direct connection between the cytoplasms of the two organisms. 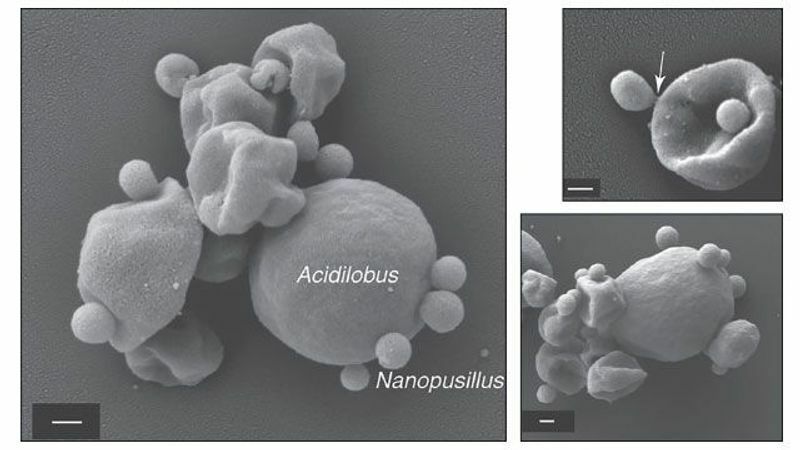 (Lower image: Nanopusillus acidilobi on Acidilobus sp. 7A cells; scale bar = 200 nm. Top image: Nanopusillus equitans on Ignicoccus hospitalis; scale bar = 100 nm.). 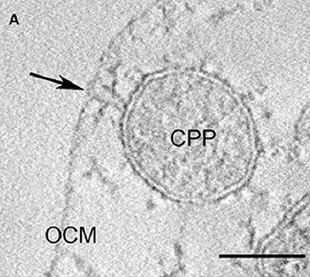 Meanwhile, Mircea Podar, a microbiologist at Oak Ridge National Laboratory in Tennessee, has successfully cultured a member of the thermophilic Nanoarchaeota, a founding phylum of the DPANN group, as well as their larger Crenarchaeota hosts. As ectosymbionts, these and other nanoarchaea are often found attached to the surface of their hosts, and seem to be genomic minimalists, having lost many genes over their evolutionary history. Presumably, DPANN archaea get what they need from the better-equipped hosts, as well as from the environment. A group of German researchers figured out how to culture one nanoarchaeon-crenarchaeote pair in 2002,10 and Podar added another pair to the list in 2016.11 He’s now collecting other DPANN archaea and their hosts from around the world to investigate how the two symbiotic microbes communicate, exchange nutrients, and coevolve. Another question is the nature of the species’ relationship. Is the nanoarchaeon a parasite, bleeding the crenarchaeote of nutrients? Is it a commensal, benefiting from the partnership with no effect on the bigger microbe? Or does the crenarchaeote derive some benefit itself, making it a mutualistic relationship? Experiments documenting the growth of these archaea in culture provide some hints. I. hospitalis grows more slowly when cocultured with N. equitans than when it’s alone, suggesting it may be suffering due to parasitism—though the host doesn’t behave as if it’s stressed or defending itself.13 “Maybe somewhere between a parasite and a commensal,” Podar guesses, though he cautions that these experiments only tell how the organisms behave in lab cultures. Archaea have emerged as the primary methane producers on the planet. For example, one member of Woesearchaeota is missing genes involved in glycolysis, pyruvate metabolism, and the Krebs cycle, suggesting the organism may rely on a host to metabolize nutrients. The species is also missing genes to synthesize certain amino acids and nucleotides, which it might scavenge from the environment. What some Woesarchaeota do have is a gene apparently encoding a large extracellular enzyme that could help it stick to other microbes, which might, Castelle speculates, allow the species to gather the metabolites it can’t make itself. 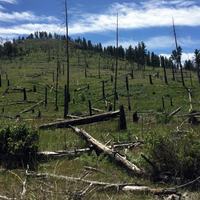 The more researchers learn about archaeal biology, the more apparent it becomes that these microbes play a key role in the Earth’s biogeochemical cycles, transmitting carbon, nitrogen, and other elements central to life in and out of molecules. Even Castelle’s Woesarchaeota, for all they lack, participate in nutrient cycling. They contain enzymes that allow them to use carbon compounds and hydrogen as energy sources to make products such as lactate and ethyl alcohol, which other microbes may then use as their own energy source. Tyson’s group at the University of Queensland started its metagenomic investigation of archaeal methanogens at Australia’s coal seam gas mines, where pumps bring water up from underground to release natural gas—mostly methane—from the coal below. On two collecting trips in 2013, postdoc Paul Evans packed 0.22-micron filters, about 100 kilograms of dry ice, and other gear for a weeklong tour. A mining company guide drove him from site to site in regions with temperatures pushing 40 degrees Celsius (more than 100 degrees Fahrenheit), where Evans would hook the filter to the pump to collect microbes (and a fair amount of dirt). He stored the samples on dry ice, then isolated the DNA when he got back to the lab. 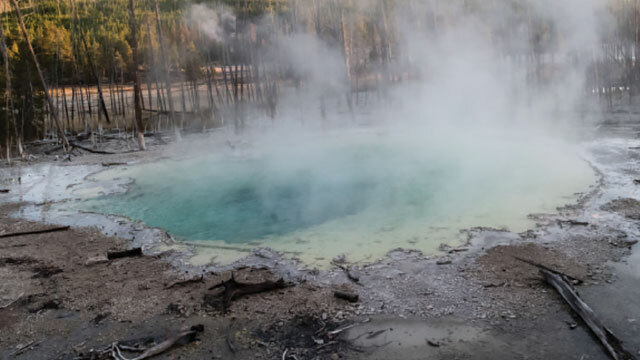 ARCHAEAL HUNTING: Oak Ridge National Laboratory microbiologist Mircea Podar and colleagues discovered two previously uncultured archaeal species in the Cistern Spring at Yellowstone National Park: Nanoarchaeota acidilobi and its host, Acidilobus sp. 7A. Indeed, culturing these newly discovered organisms continues to be the primary hurdle in the field, with many archaea still never having been directly observed. When it comes to Asgard archaea, for example, “we have no clue what the cells look like and how they interact with other cells,” says Ettema. The same is true for most other species. Unlike bacteria and eukaryotic microbes, archaea—as far as researchers can determine—do not act as pathogens that sicken other organisms, such as animals or plants. Archaea themselves, on the other hand, are by no means immune to infection, specifically by viruses. 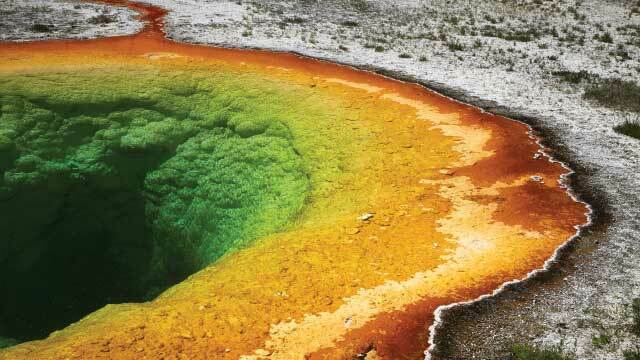 Montana State University’s Mark Young, who has analyzed viral genomes from hot springs in Yellowstone National Park, estimates that each archaeon is infected with an average of two or three different viruses, some of which may even benefit their host. Archaea-infecting viruses exhibit diversity as astonishing as that of the microbes themselves. All told, scientists have isolated more than 100 archaeal viruses, and already they’ve noted a remarkable variety of clades and shapes, especially compared to viruses that infect bacteria. There are more than 6,000 known bacterial viruses, which fall into just 10 families. But there are already at least 17 families of archaeal viruses. “Virtually every one we find is forming a new family,” says Young. There are the lunar lander–looking phage shapes, familiar from bacterial biology. 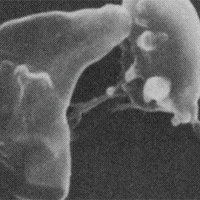 Then there are spindle-shaped archaeal viruses, with one tail or two. There are long, skinny ones and round ones, bottle-like ones and droplet-shaped ones with little beards, and more. Archaeal viruses even show variety in how they arrange their DNA, with some genomes naturally adopting a more compact structure than those found in most forms of life, possibly for protection from extreme conditions (Science, 348:914-17, 2015). So far, researchers have only developed host-virus model systems for a few pairs, such as icosahedral (STIV), spindle- (SSV1), and rod-shaped (SIRV2) attackers of the thermophilic archaeal genus Sulfolobus. These systems are helping to relate archaeal virus infection to that in bacteria and eukaryotes. For example, STIV uses the host’s ESCRT proteins in its replication system, as do Ebola and HIV (PNAS, 110:10783-87, 2013). The virus’s major capsid protein (MCP) also adopts a “double jelly roll fold” like that of some viruses that infect eukaryotes and bacteria (PNAS, 102:18944-49, 2005). These findings suggest that at least some viral lineages had formed before the three branches of cellular life diverged. In other words, the common ancestors of bacteria and archaea might have been infected by the ancestors of these modern viruses. Over time, bacteria evolved defenses, such as their complex cell membrane and peptidoglycan cell wall. But archaea still lack such structural defenses; perhaps that’s why they’re susceptible to such a wide variety of viruses, suggests virologist David Prangishvili of the Institut Pasteur in Paris. However these diverse viruses evolved, it’s clear that there are many more archaeal viruses yet to be discovered, and researchers will no doubt continue to identify and characterize new species as they continue to unearth new archaea. “Whenever we try a new environment or host, we have new viruses,” says Prangishvili. D.Y. Sorokin et al., “Methanogenesis at extremely haloalkaline conditions in the soda lakes of Kulunda Steppe (Altai, Russia),” FEMS Microbiol Ecol, 91:fiv016, 2015. D.Y. Sorokin et al., “Discovery of extremely halophilic, methyl-reducing euryarchaea provides insights into the evolutionary origin of methanogenesis,” Nat Microbiol, 2:17081, 2017. A. Spang et al., “Genomic exploration of the diversity, ecology, and evolution of the archaeal domain of life,” Science, 357:eaaf3883, 2017. C. Rinke et al., “Insights into the phylogeny and coding potential of microbial dark matter,” Nature, 499:431-37, 2013. S.L. Jørgensen et al., “Quantitative and phylogenetic study of the Deep Sea Archaeal Group in sediments of the Arctic mid-ocean spreading ridge,” Front Microbiol, 4:299, 2013. H. Hartman, A. Federov, “The origin of the eukaryotic cell: A genomic investigation,” PNAS, 99:1420-5, 2002. A. Spang et al., “Complex archaea that bridge the gap between prokaryotes and eukaryotes,” Nature, 521:173-79, 2015. K.W. Seitz et al., “Genomic reconstruction of a novel, deeply branched sediment archaeal phylum with pathways for acetogenesis and sulfur reduction,” ISME J, 10:1696-705, 2016. K. Zaremba-Niedzwiedzka et al., “Asgard archaea illuminate the origin of eukaryotic cellular complexity,” Nature, 541:353-58, 2017. H. Huber, “A new phylum of Archaea represented by a nanosized hyperthermophilic symbiont,” Nature, 417:63-67, 2002. L. Wurch et al., “Genomics-informed isolation and characterization of a symbiotic Nanoarchaeota system from a terrestrial geothermal environment,” Nat Commun, 7:12115, 2016. T. Heimerl et al., “A complex endomembrane system in the archaeon Ignicoccus hospitalis tapped by Nanoarchaeum equitans,” Front Microbiol, 8:1072, 2017. R.J. Giannone et al., “Life on the edge: functional genomic response of Ignicoccus hospitalis to the presence of Nanoarchaeum equitans,” ISME J, 9:101-14, 2015. C.J. Castelle et al., “Genomic expansion of domain archaea highlights roles for organisms from new phyla in anaerobic carbon cycling,” Curr Biol, 25:690-701, 2015. J.W. Schopf et al., “SIMS analyses of the oldest known assemblage of microfossils document their taxon-correlated carbon isotope compositions,” PNAS, 115:53-58, 2017. P.N. Evans et al., “Methane metabolism in the archaeal phylum Bathyarchaeota revealed by genome-centric metagenomics,” Science, 350:434-38, 2015. I. Vanwonterchem et al., “Methylotrophic methanogenesis discovered in the archaeal phylum Verstraetearchaeota,” Nat Microbiol, 1:16170, 2016. R. Laso-Pérez et al., “Thermophilic archaea activate butane via alkyl-coenzyme M formation,” Nature, 539:396-401, 2016. Correction (June 5): The beginning of this story has been changed from its original version to reflect the fact that methane does not smell. The Scientist regrets the error.